In the 2D section, the Elements picture the basic structure for all other phenomena: the evolution from incarnation until disintegration. We use 7 stages to picture this and, fractal-wise they are mirrored in every other group or family. Consequently these 7 stages are represented in Bacteria, Gems, Sarcodes, Monocots, Dicots, Insects, Birds, in short, all the families. So, while Mammals for instance may essentially belong in the 6th row, as they have the issue of mastering/managing/relating to the world, there are clearly big differences in development, evolution and complexity. The 6th row issues from mouse and a lion should be differentiated with another fractal of 6 rows, mirroring development stages. Another example: Dicots too fit in the 6th row. Taxonomy distinguishes 6 Orders of Angiosperms; they essentially represent the themes of the 6 rows in the Periodic Table. The same can be said from Insects, Fish, Monocots, as a matter of fact, any Family. Hopefully this understanding takes away the confusion that might arise when we try to classify the Animal kingdom as a whole. When we don’t take the fractal nature into account, what we’ll end up with is a more or less random distribution of families from ‘primitive to evolved’, over the 6 rows of the Periodic Table. We’ll find Mammals appear from row 2 to 6, Birds distributed all over the Periodic Table and the like. It’s logical and based on observation, but it skips one important step. And that step is to first determine the place of the bigger group they belong to. 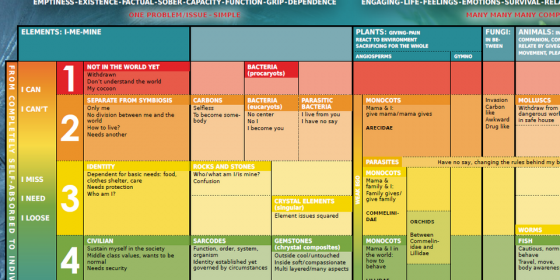 The Vital Approach Map of Homeopathic Families’ gives an direct overview and displays the vertical and horizontal relationship to other groups visually. When we analyse from bigger groups to smaller and smaller until we come up with a species, and I take as example Gadus morhua it looks like this: first 3D charactistics, then: Animals characteristics, then: 5th (or 4th ) row issues. On the Map the choice is narrowed down to Fish or Birds, so that choice is not too hard to make. When one decides on the family Fish, then again to find the species, you need the issues from the rows of the Periodic Table to finally find the more primitive or more developed substance suitable for the patient. In this analysis, the first division is the most important, then comes the 2nd, then the 3rd etc, this means that when you concluded you need a Fish from the 5th Row, based on just names characteristics, these will be more prevalent than the row 3 issues that will help you to determine which Fish you’ll need. It is good to keep in mind that the patient has the tendency to act, try out, exercise and display what he doesn’t have. This very important background information helps to understand the behaviour of the patient, though it might be confusing. A Plant from the 1st Order will struggle to relate to and manifest himself in the world (6th Order issues) while a 6th Order Plant will search for the unity (1st Order issue) he is missing. These represent the opposite actions of their basic sensation; it is clear that what you are or have, you don’t have to aim at. A problem you don’t have you don’t talk about, do you? A Plant from the 2nd Order will strive to relate to the other in an equal relationship (Order 5 issue) while an Order 5 Plant will struggle to establish clear boundaries between what is in and what is out. (Order 2 issue) Again: the action is the opposite of their vital sensation. We learned that ‘sensation and action are equal and opposite’, but it is good to remind us how this plays out in the patient in front of us. What is natural to us, is mostly unconscious and thus no problem. We won’t go to a therapist complaining our heart is silently doing its job or we have a sound sleep. When we are not afraid of being alone, or to talk in public, or we aren’t anxious about the future, we don’t talk about it. Yet we try to balance out what we in ourselves experience as difficulties or missing. Animal cases usually do this by projecting their issues onto somebody else; as homeopaths we know that everything you say from the other is about yourself. That’s why I say we don’t look to the world through coloured glasses, but in reality, we wear mirrors. In attempting to come to terms with the others, Animal patients’ challenge is to find the overarching oneness in the difference with the others in a total non-judgemental and fearless way. We can also have patient who do their utter best to adapt, to be normal, to do what others do because their Vital sensation is to be inadequate, maladjusted and disconnected. These patients need Artificial Human Artefacts. I hope this makes clear that a lot of work and understanding needs to be done before we decide on looking for a remedy. First a clear analysis needs to be made, as to make sure we are not endlessly searching around in the wrong place. Look at the Map like this: it’s a Map of the World, with 2 big landmasses: 2D and 3D. Therein you can see the continents (Families). In the continents there are countries and provinces (Gymnosperms, Angiosperms, Monocots, Dicots etc) and there in you’ll find 7 levels of development. Starting to dig for the treasure, the similimum for the patient, in the wrong continent or the wrong country therefor is rather hopeless. On the other hand: with a good Map in your hand, it shouldn’t be that difficult…..